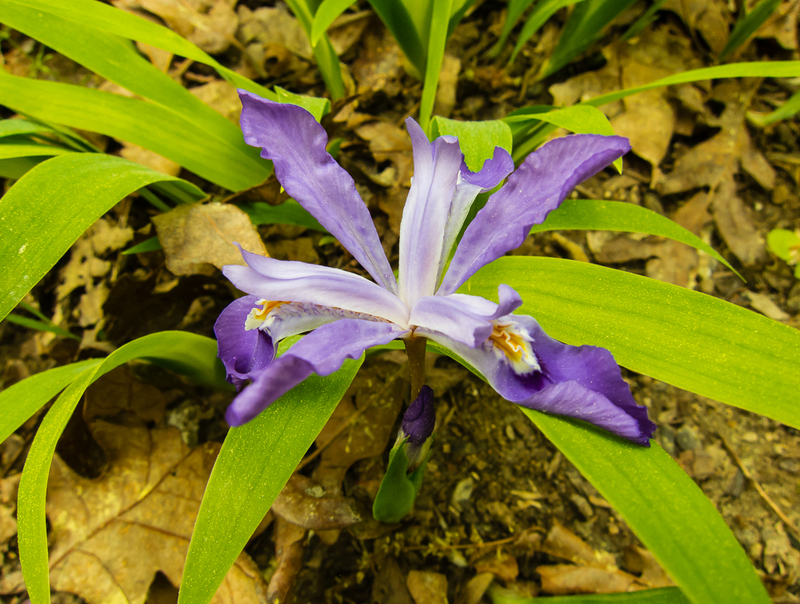 I am a native plant promoter and have been for many years. 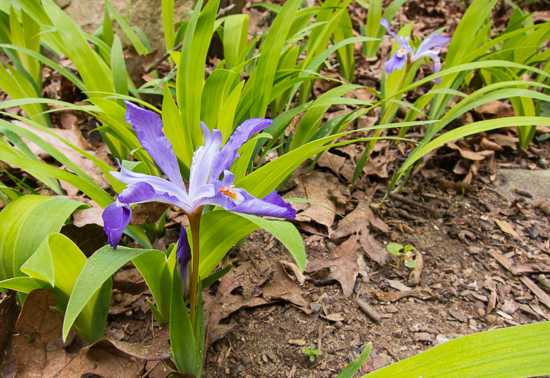 While there is nothing wrong with planting ornamentals in the landscape (as long as they are not potential problematic invasives) I appreciate getting to know our native species and encouraging them in my landscape and in those of schools and other public areas where I work. 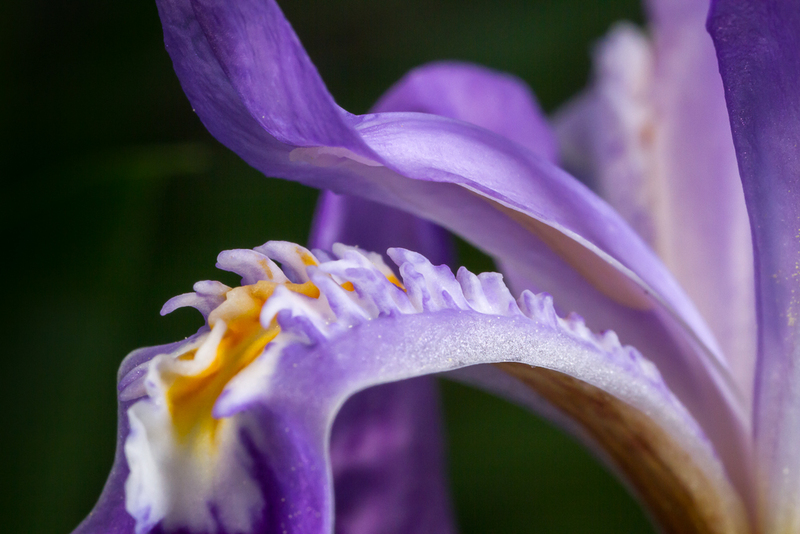 A connection with native species is just one more way to help people become better stewards of our natural areas. 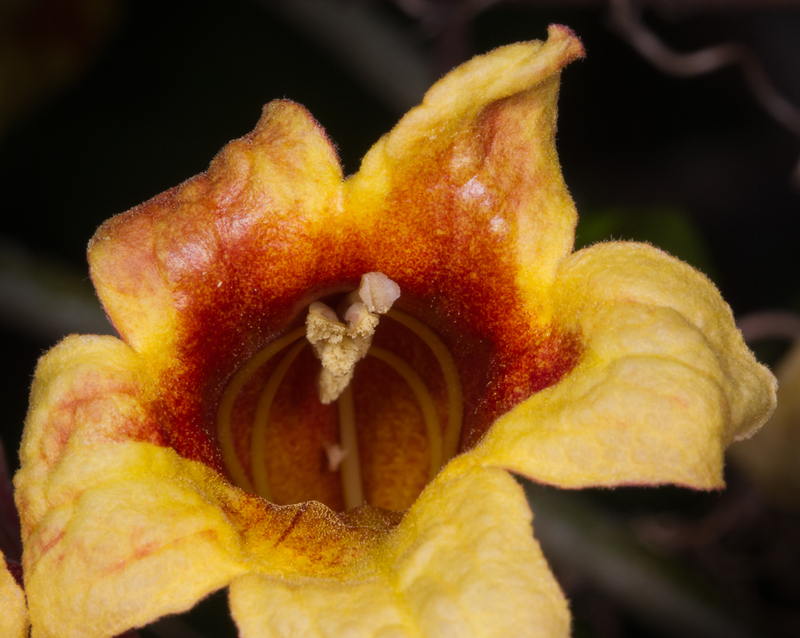 And I have a particular fondness for spring blooming species like Crossvine, Bignonia capreolata. 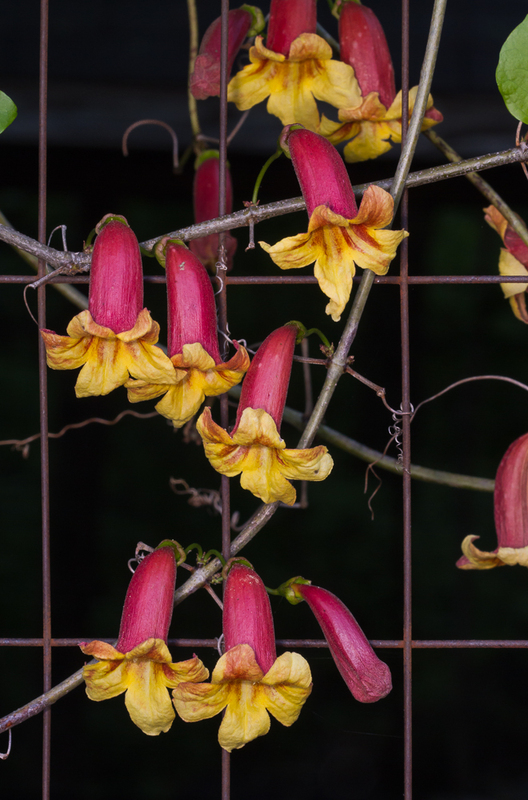 I remember seeing my first Crossvine blossoms many years ago – lying on the ground, not hanging on the vine. I looked up and finally saw the vine with attached blooms way up in the top of an ash tree. 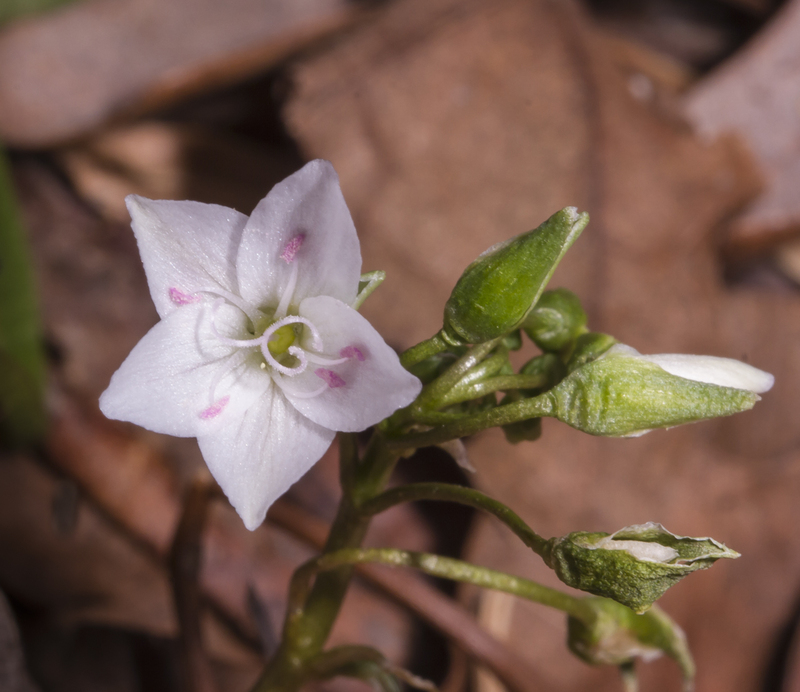 This may be why this beautiful vine has not caught on more with homeowners – relatively few people see it in its glory because it often grows 50 feet or more into the canopy. But if planted along a fence, trellis, or even a dead snag where we ground-dwellers can appreciate it, Crossvine can be spectacular. 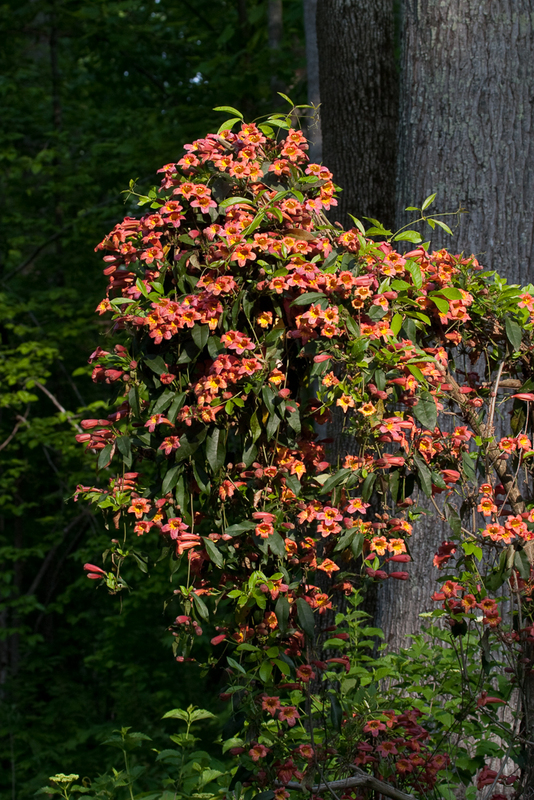 I once stuck a cedar snag in the ground and planted a variety of Crossvine that had more orange than most wild specimens and it provided a beautiful spray of flowers every April and early May. 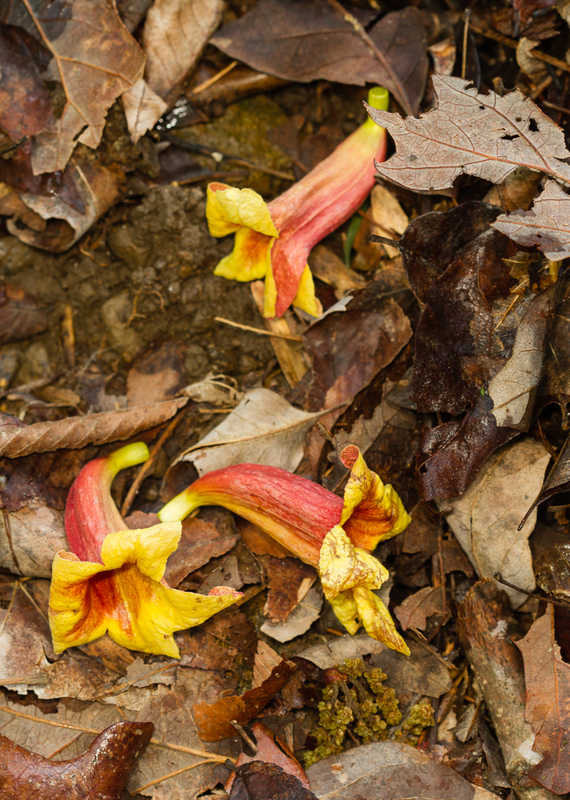 The bloom time, color and shape of the flowers hint that Crossvine is a favorite of Ruby-throated Hummingbirds returning to their breeding grounds in the southeast. 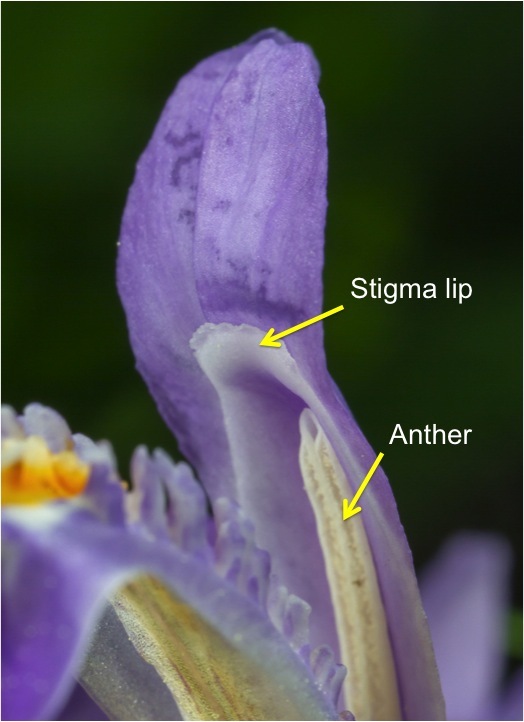 When a hungry hummer pokes its head and bill into the flower it is likely to touch the flower parts, which are clustered near the roof of the flower tube. 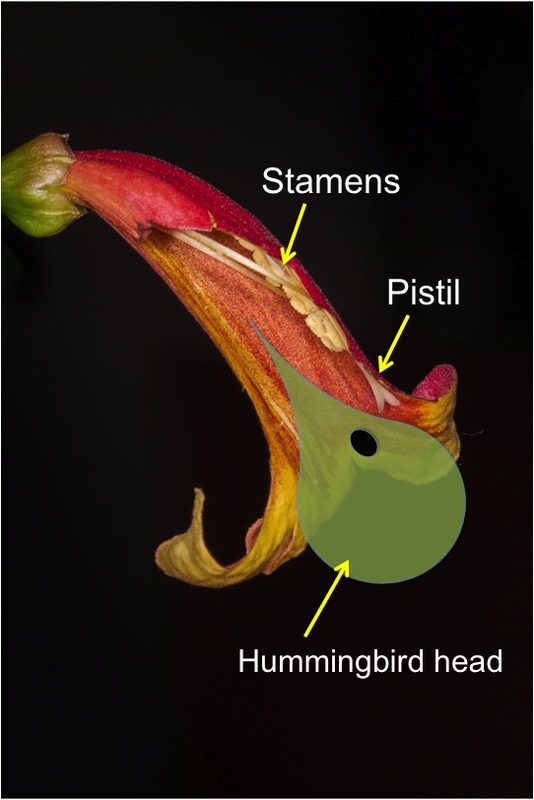 This transfers any pollen on the hummingbirds’ head to the pistil (female part) and dusts its forehead with new pollen from the anthers (male part of flower) as it exits and zips to the next Crossvine blossom. I have also watched bumblebees and a few swallowtails visit the blossoms. 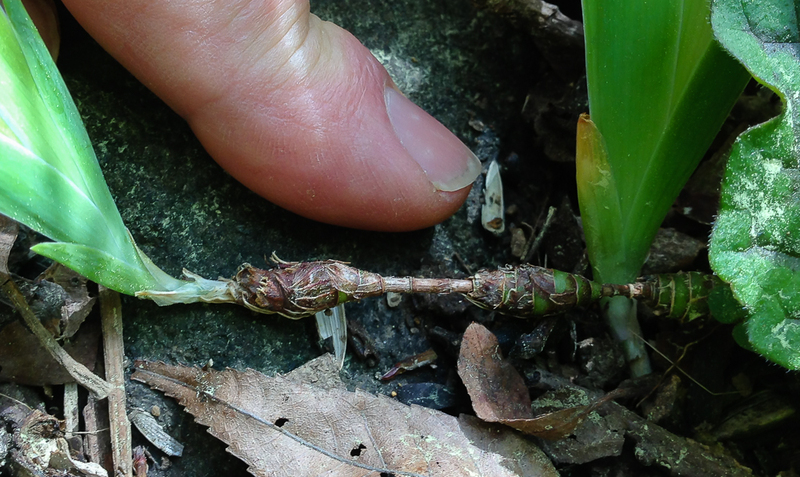 It is also a host plant for the Rustic Sphinx Moth, although I have never seen one feeding on it (yet). 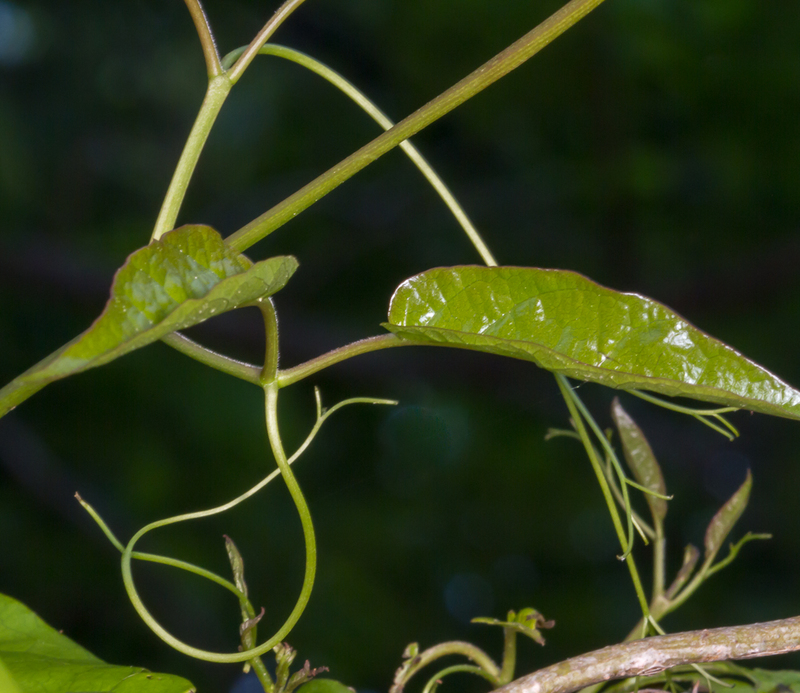 Like its close relatives, Trumpet Creeper and Catalpa, the flowers of Crossvine produce long pods filled with flat, winged seeds that are wind-dispersed. 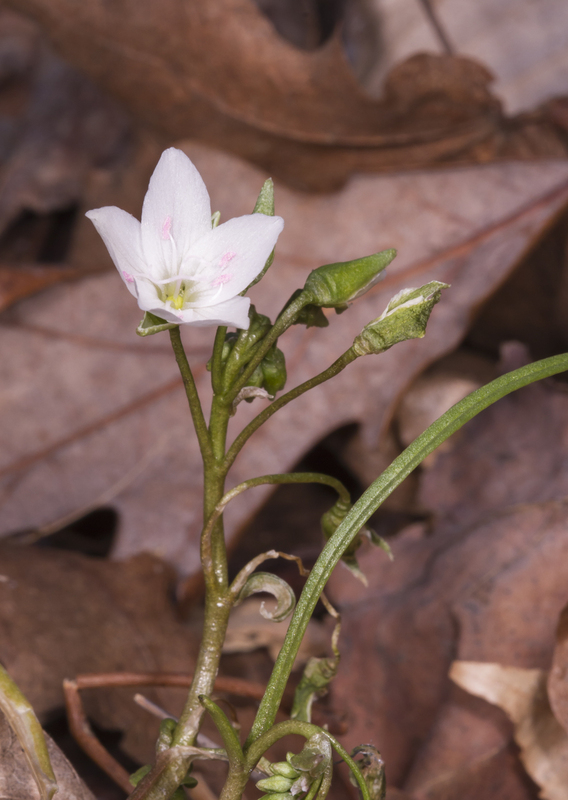 It also spreads from root sprouts and can be found creeping along the ground in many places in the Piedmont and Coastal Plain, especially bottomland forests. 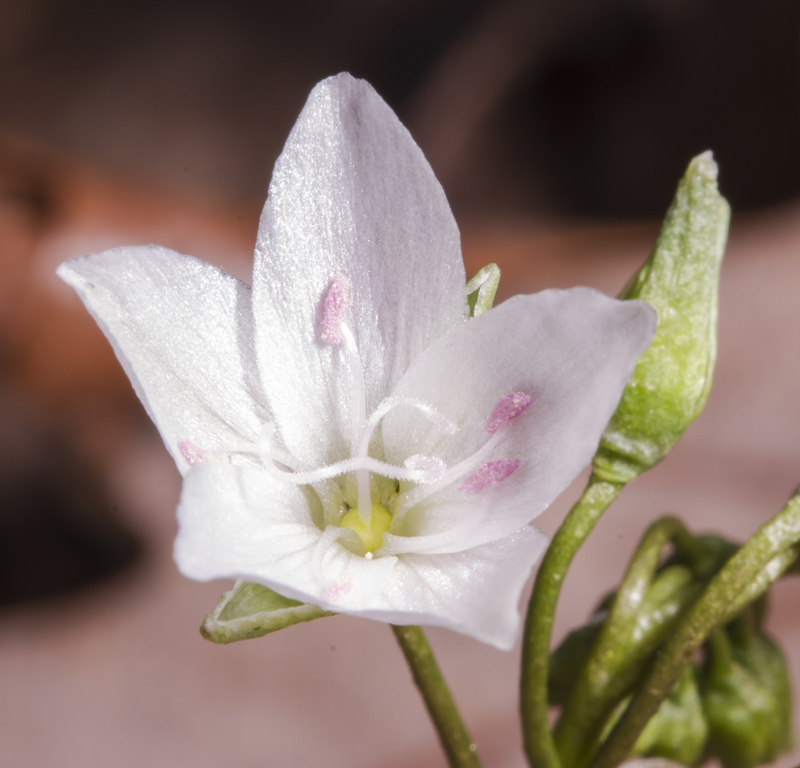 The leaves are a bit unusual in that they are really leaflets divided into three parts – two shiny, semi-evergreen leaves, and between them, a leaflet that is modified into a coiling tendril, which allows the vine to cling to tree trunks, fences, and almost anything else it touches. 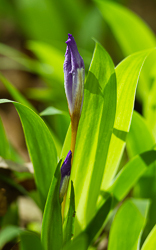 The leaves are a dark green in summer and often turn purplish-green in winter before falling right before the new bright green spring growth appears. 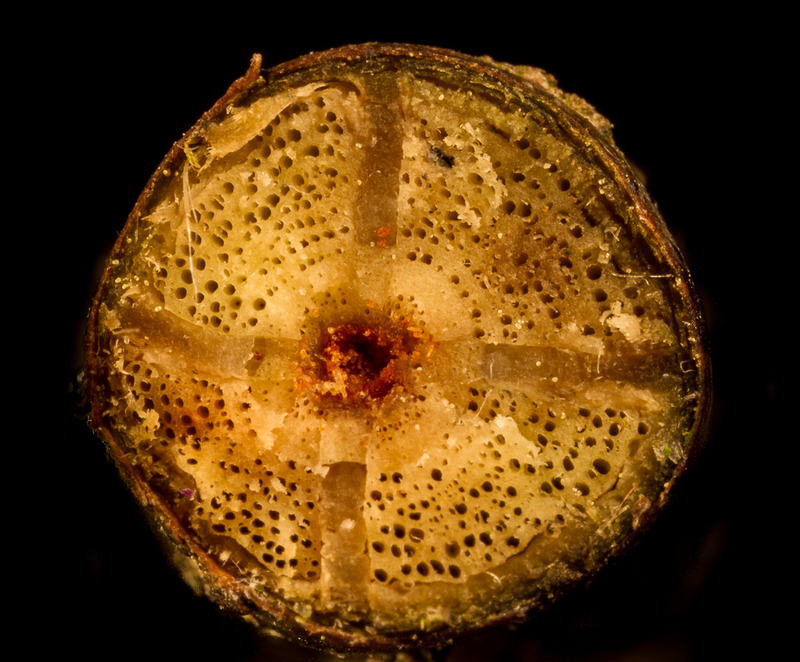 While I think the leaf arrangement as the vine climbs up a tree trunk has a resemblance to a cross or a bent “X”, the plant is supposedly named for the cross pattern seen in the pith when you cut a cross section of the vine. Do yourself and your hummingbirds a favor and plant one of these beautiful native vines in your landscape this season and you can enjoy it for years to come.